You thought Wuppertal was the only place in the world where there was a Schwebebahn? Wrong! 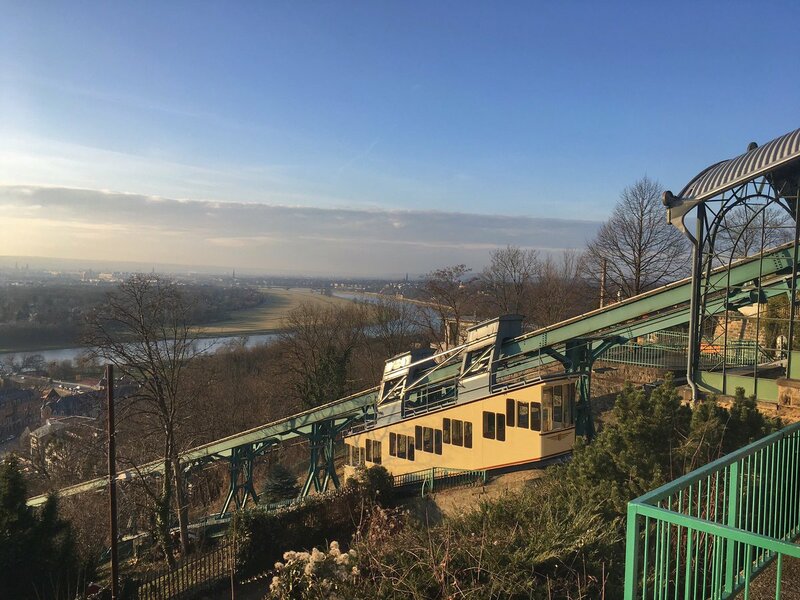 There’s one other and its at Dresden which showed Eugen Langen’s new monorail system’s various capabilities including doubling as a mountain railway. Indeed there was nothing to stop the idea of a Schwebebahn being built anywhere else because the concept was so simple. 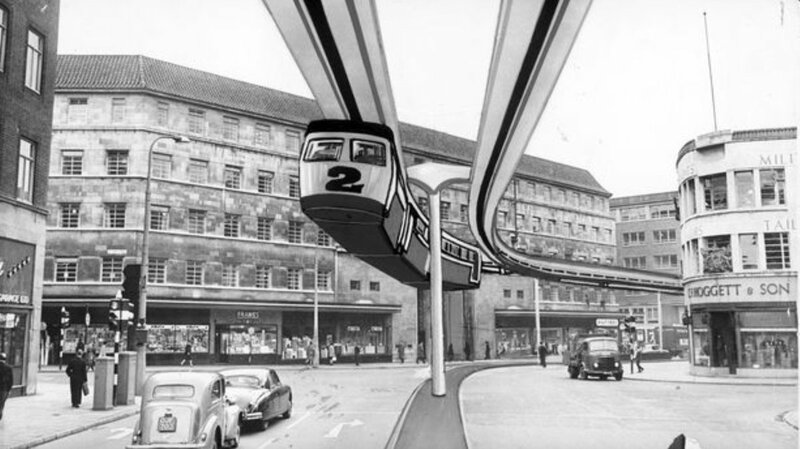 The UK too had its share of ideas for monorails (similar to the Schwebebehn or not) in some of its towns and cities. Let’s have a look! 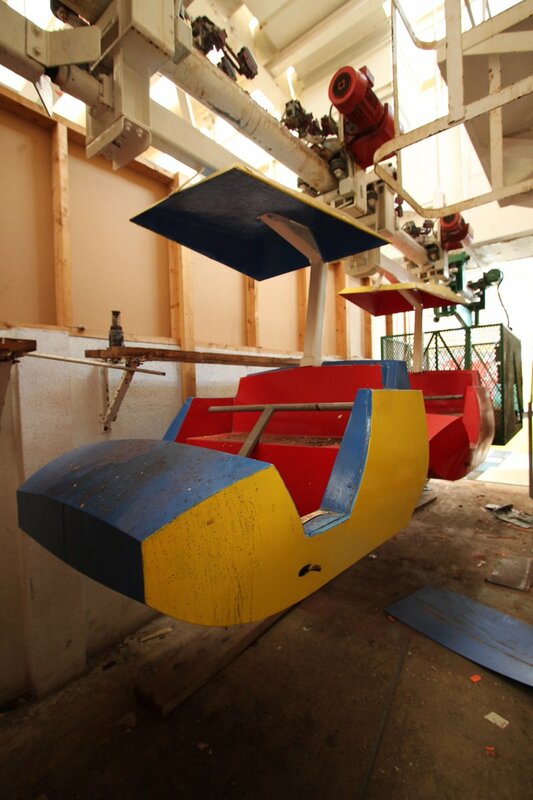 The only successful monorail systems that have been built in the UK and Ireland are small systems within a number of theme parks or Butlins holiday camps and built in the sixties – whilst others such as Blackpool (closed 2012) remain partly derelict, or the two systems at Rhyl, the unique one at Merry Hill, and that at Chessington Zoo which have been demolished. Nearly all ran on the straddle beam system. Perhaps the largest and most substantial UK system was that at Merry Hill, near Birmingham. It had fully enclosed cars with sliding doors, proper stations with ticket offices, barriers, several routes and various fares. The system ran for just five years before shutting in 1996. Rhyl in North Wales tried to be more ambitious and it constructed a system with more proper trains than these dinky little cars with fringes on the top! Alas the system proved too troublesome and after just eight weeks it closed down for good! 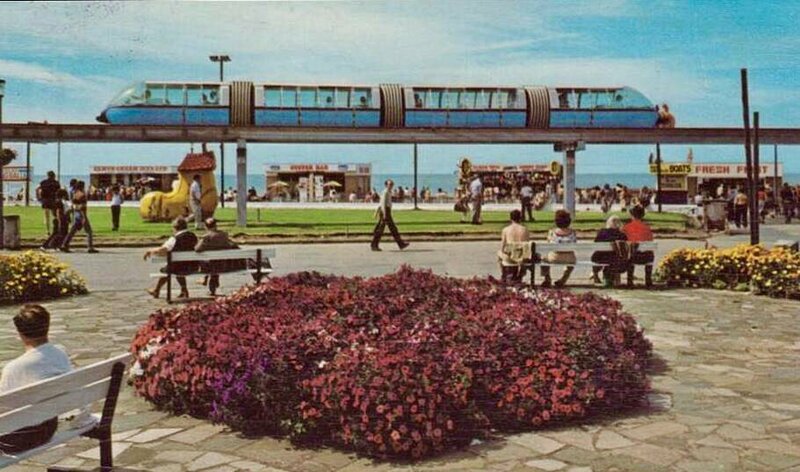 Rhyl managed to have TWO monorail systems and the second fared much better. 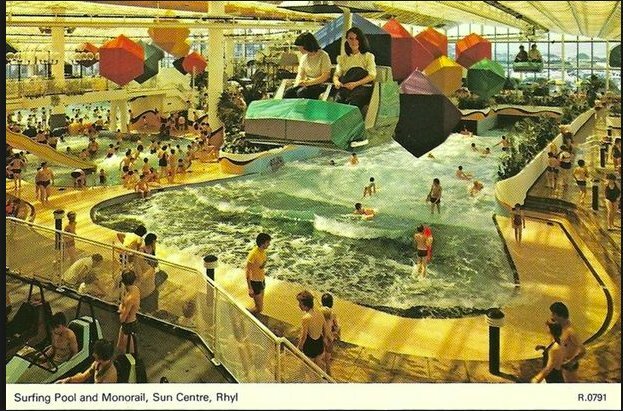 It was a hanging monorail system unique to the UK and ran inside (and a short distance outside) at the Rhyl Sun Centre (Heulfan.) The centre sadly closed in 2014 and has now been demolished. 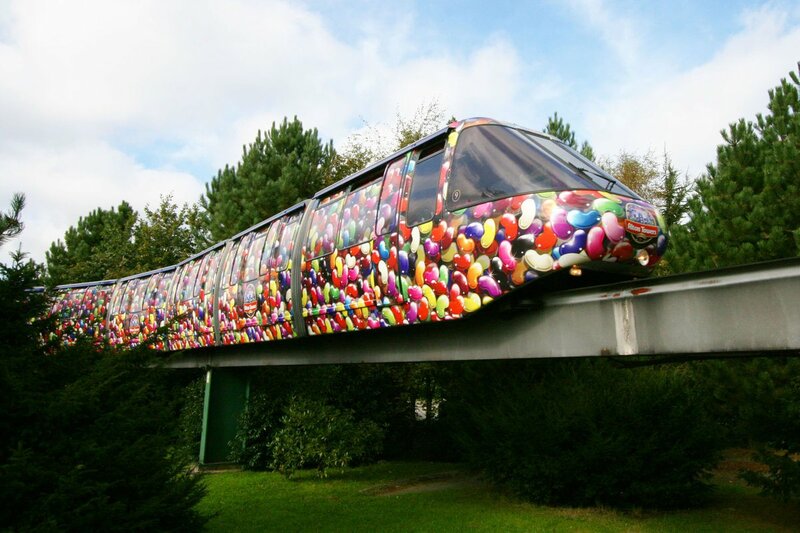 Gateshead had a short lived monorail that featured as part of the City’s 1990 Garden festival. 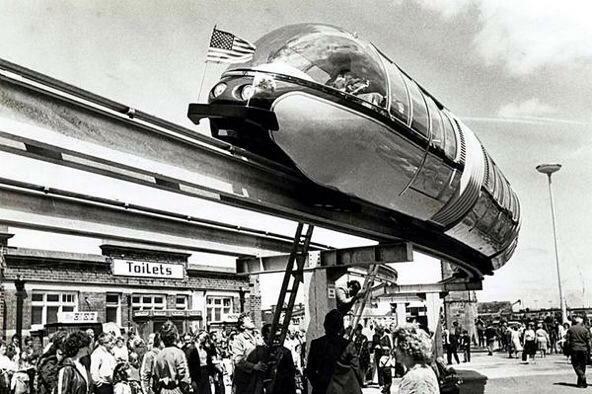 Having mentioned Butlins earlier, here’s one of their monorail systems. This clearly was a smaller UK attempt to emulate the bigger ‘Alweg’ ones at Walt Disney’s resorts in the USA. Like others in the UK its too no more. 1965 news just in! 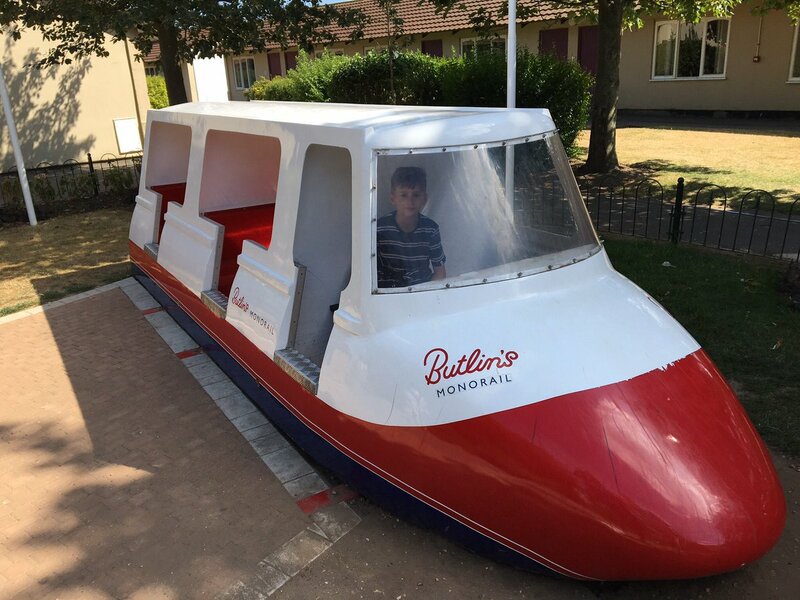 Butlin's Skegness has introduced a monorail. 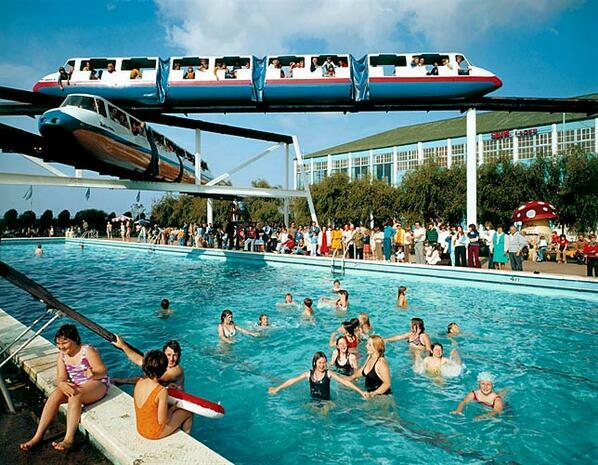 Butlins ended its use of monorails after an accident at Minehead which resulted from poor safety standards. Independent. 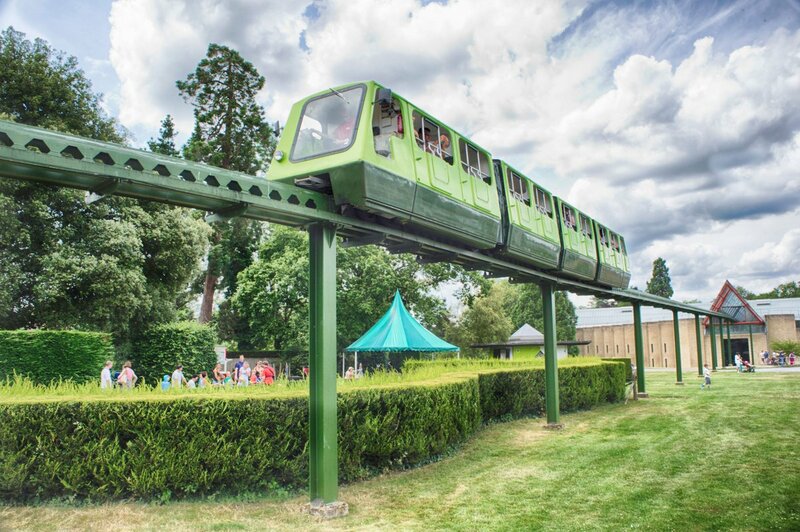 The only extant monorail systems in the UK these days are those at Alton Tower, Beaulieu, Chester Zoo, Flamingo Land and Great Yarmouth. Of all these both Alton Towers and Chester have fully enclosed cars and sliding doors. 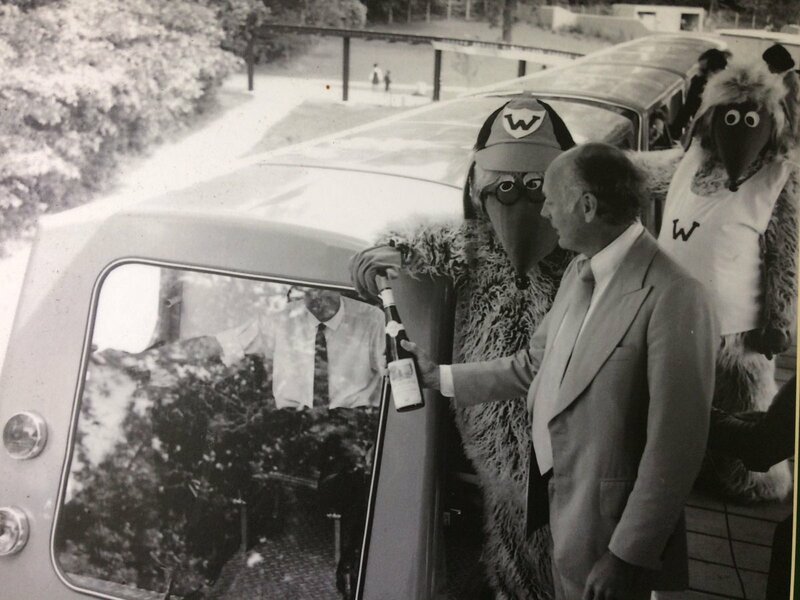 Beaulieu, the oldest running system in the UK, has partially enclosed cars but only half doors and no windows. 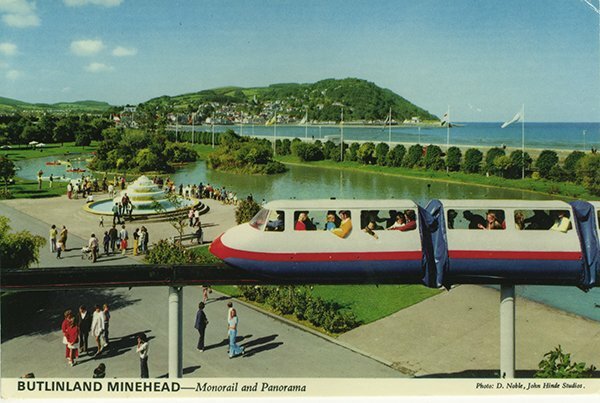 Apart from seaside resorts, theme parks and holiday camps, monorails were indeed proposed for several towns and cities – here’s a rundown of those schemes. 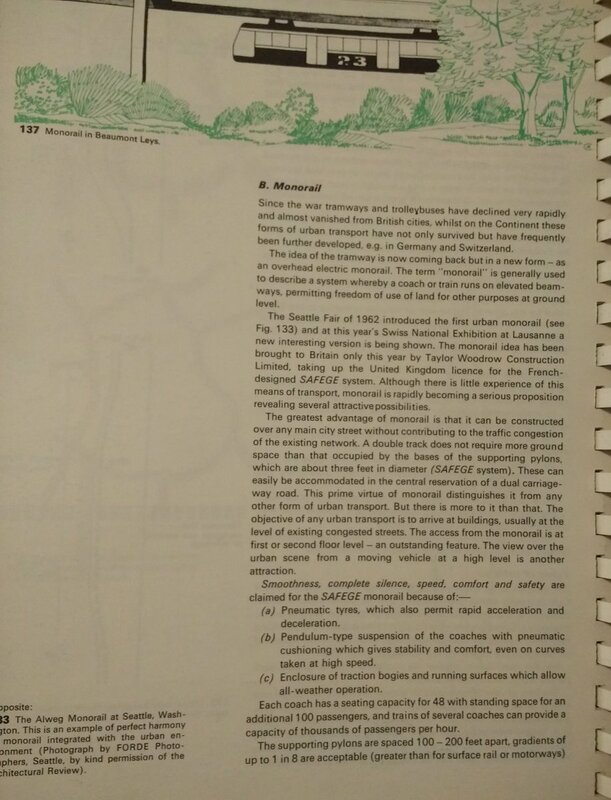 Recently a modern version of the concept was drawn up to show how the monorail if built would have looked today. More on this apparently ‘crazy’ idea can be seen at Secret London. That wasn’t the only attempt in London. 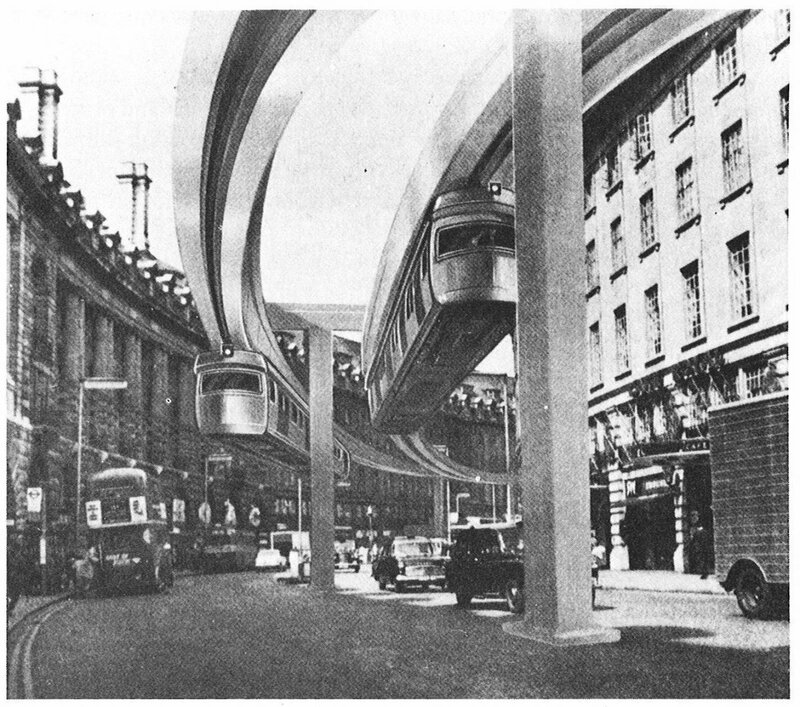 A huge monorail scheme for London was proposed in the 1900s (I have written about this previously) and was possibly to be built on the Lartigue system. It didnt get off the board. Yet the original proposals were strong enough, being enshrined in an act of 1882 and for the Great Central railway company to agree to digress and prepare in advance for this new transport system. 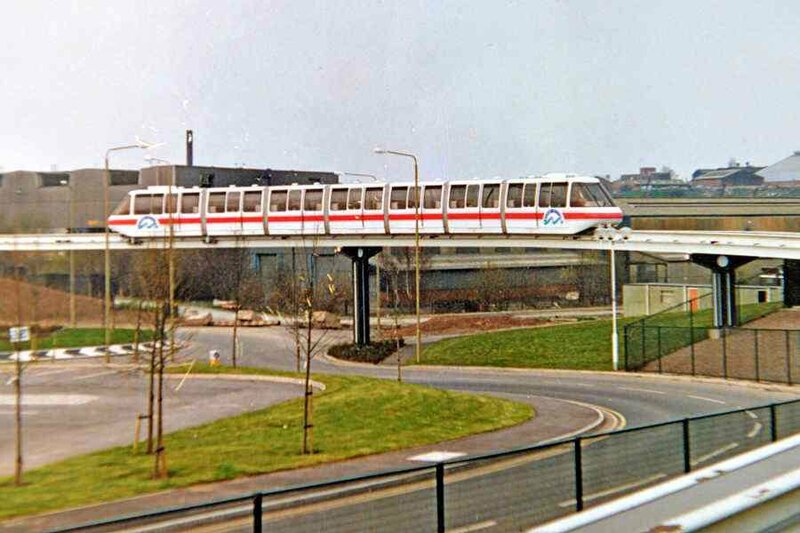 The Metropolitan didnt need to do anything for its bridge was one whole span and easily crossed the route of the new monorail. 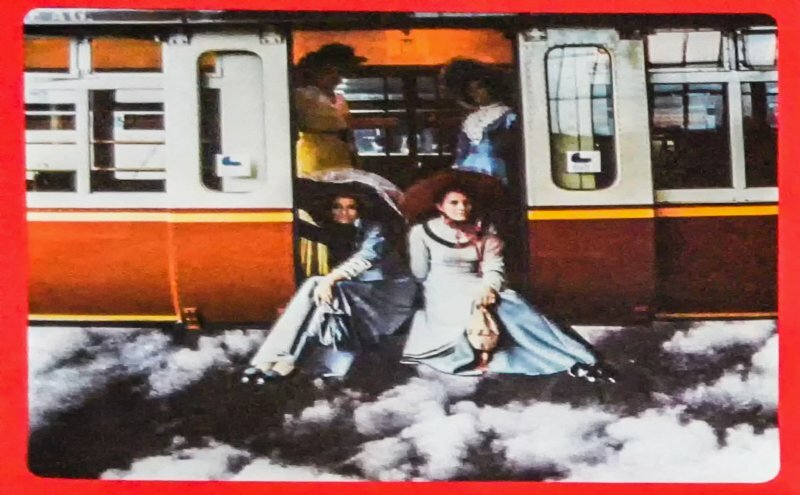 As this picture shows the Metropolitan Railway’s bridge (nearest to camera) was fortunately wide enough to accommodate a proposed new monorail system. The Great Central’s bridge further along had to be modified to include the extra span required. Very few know of this rather obscure bit of London’s history! What the GCR did was to build an extra span in their new bridges near to Park Road! This span would facilitate a new railway which was eventually known as the North Metropolitan & Regents Canal monorail. That would run alongside the Regent’s canal and then pass under the new railway bridge unhindered. There we have it! A structure in London the public can actually walk through intended for a monorail! The only structure in London ultimately built for a monorail system! Its the Great Central (now Chiltern Railways) bridge at Lisson Grove. Mention must be made of the ‘secret’ 10 mile long monorail between St Johns Wood and Elstree. 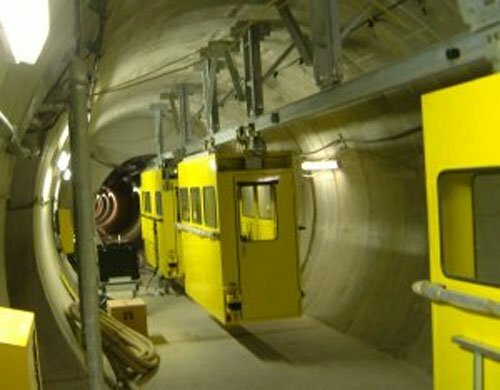 It was opened in 2005 and its solely for the purposes of the National Grid to maintain its electricity cables. Gizmodo has the details. There are however two systems in the UK very much similar and both are in London. The other runs from Beddington to Rowdown – see this article from Fata Automation. Leicester proposed a seven and half mile long system in the sixties at a cost of £135 million pounds. The council ultimately rejected the plans. 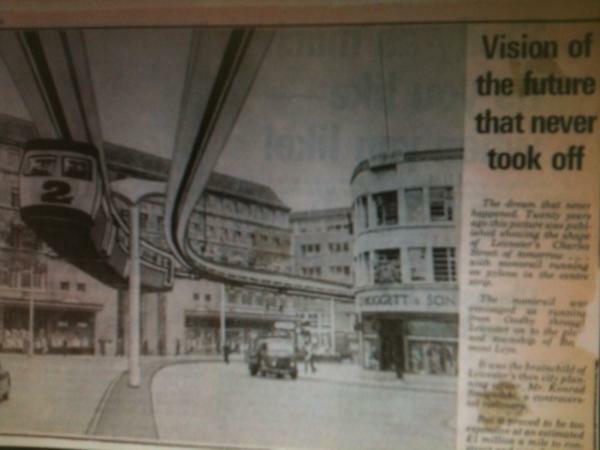 Finally, the notion of a monorail in Leominster is the only attempt at depicting a true Schwebebahn system in the UK. 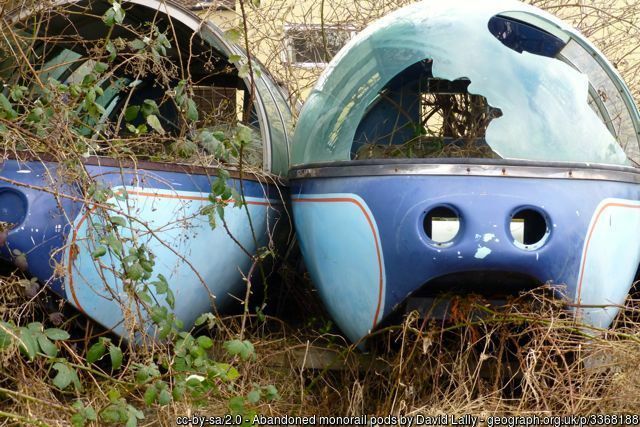 However I think the idea of having an Eugen Langen monorail in deepest Herefordshire was in fact quite fanciful. Its just an idea put out to illustrate the future and the location so chosen was probably wishful thinking! Leominster’s not even big enough to warrant a metro system and didnt even possess a single tram! In terms of other systems the unique and wonderful monorail system from Listowel to Ballybunion in Ireland is a well known example – out of all the monorail systems found in these offshore islands it was totally unique in running at ground level and had special types of level crossings. The Cambridgeshire Fens too had its 1960s experimental Hovertrain, whilst the Scottish lowlands had the famous experimental Bennie Railplane however these unique systems are really beyond the scope of this article. Blackpool Pleasure Beach had one. However it’s since been demolished. Luton Airport is building one, I think, but cable-driven.